The 28th anniversary of World Press Freedom Day, May 3 each year, marks the first anniversary of the Egyptian authorities’ massive campaign to block press and media websites, which reached 98 blocked sites, according to the latest survey by the Association for Freedom of Thought and Expression (AFTE). The Egyptian authorities continue their refusal refused to disclose the body responsible for the blocking operations and the legal framework regulating them, while parliament is engaged in eager attempts to legalize the blocking operations carried out by authorities in Egypt. Another year of the reality of the Egyptian press and media scene, in which the state’s grip has increased significantly on all platforms and media outlets, whether hard copies, audio, visual or digital, state owned or private. The state continues to restructure the Egyptian media market through systematic processes of transfer of property, including suspected involvement of security bodies. Violations against journalists continued during this year; their rate may be statistically less than in previous years, but their severity have changed qualitatively. The number of imprisoned journalists reached 21, including the editor of the Masr El-Arabeya website, journalist Adel Sabri, whose detention pending investigation was extended for 15 days by the Dokki prosecution on Thursday, 5 April 2018, in State Security Case no. 441/2018, on account of 4 charges: spreading false news, incitement to disrupt the Constitution, joining a banned group and inciting demonstrations. In the same context, the management of the Egyptian daily Al-Masry Al-Youm, a widely distributed, privately owned Egyptian newspaper, published a decision to expel Editor-in-Chief Mohamed al-Sayyed Saleh from his post, against the background of a major crisis between the newspaper and the National Election Commission when the latter filed a complaint to the Superior Media Council concerning a headline in the paper on 29 March 2018, which the Commission considered to be an accusation of the state of mobilizing voters, as well as what was published on the website of the same newspaper about presidential candidate Musa Mustafa Musa voting in the presidential elections 2018. Subsequently the the Supreme Media Council decided to refer the editor in chief and the news reporter to an investigation by the syndicate of journalists and obliged the newspaper to publish an apology to the National Commission in the same place and of equal space, in addition to imposing a 50 thousand pound fine on the newspaper. Furthermore, Attorney General Nabil Sadiq referred a complaint against the newspaper State Security Prosecution on Thursday, March 29, 2018 accusing it of insulting Egyptians. The state security prosecution summoned and questioned journalist Mohammed Saleh and eight journalists in the newspaper before releasing him on a 10 thousand pound bail. His accusations included publishing false news and statements in the Egyptian daily al-Masry al-Youm, at the time when he was its editor-in-chief. The trial of journalist and researcher Ismael El-Iskandarani continues before the Military Prosecution, where his defense confirmed that the Supreme State Security Prosecution suddenly referred the case no. 569/2015 to the Military Prosecutor General, in which Ismail was accused of spreading false news and joining a group formed contrary to the law. The case was referred to the Military Prosecutor General as no. 875 on December 13, 2017. Iskandarani is an investigative journalist specialized in marginalized communities in Egypt, most notably in the Sinai Peninsula. The Egyptian authorities arrested him upon his return from Germany to spend his annual leave in Egypt. The Supreme State Security Prosecution charged him with criminal charges, in order to circumvent the constitution, which prevents precautionary detention of journalists in publishing cases. He remained in pre-trial detention for more than two years before being referred to the military prosecutor. This year also saw the court’s final rulings against three Egyptian journalists are: Abdullah Fakhrani and Samhi Mustafa (journalists on the Rassd news network) and Mohamed al-Adli, a broadcaster at Amgad satellite channel. The Court of Cassation (the country’s highest appellate court) upheld the sentence by the Giza Criminal Court in May 2017 to five years’ imprisonment. The three journalists had been held in pretrial detention for five years after their arrest in August 2013. Furthermore, the Public Prosecution didn’t cease to use pre-trial detention as a punishment in itself and not merely as a precautionary measure to protect investigations. Periods of detention of journalists are extended without any justification. A most prominent example is that of Mahmoud Abu Zaid (Shawkan), who is serving his fifth year of detention in the case known to the media as the “Raba’a dispersal” case, which is expected to be adjudicated in the coming months. It should be noted that Shawkan was awarded the 2018 International Press Freedom Prize by UNESCO World Organization, which was deplored by the Egyptian Foreign Ministry, which expressed its protest in an official letter to UNESCO, since Shawkan is an Egyptian national accused of criminal charges and imprisoned under Egyptian laws, clearly overlooking the fact that accusation alone does not confirm a conviction in itself, and that the original legal rule is that an accused remains innocent until proven guilty. This is not the first prize awarded to Shawkan. In 2016 he received the Press Freedom Award from the National Press Institute in Washington. He suffers from “Mediterranean fever” a chronic disease, which requires continuous medical attention that is not available under the current conditions of imprisonment. He is faced with incomprehensible intransigence by the authorities concerned to receive appropriate treatment for his worsening health condition. Last April, Attorney General Nabil Sadiq issued a statement, in which he instructed the heads of prosecutions, each within its mandate, to monitor what is published or broadcasted through the various media channels and to refer any violation to criminal investigation. The statement used the same term repeatedly used by the President of the Republic in describing the various media channels, “forces of evil”, without specifying or defining the legal significance of the term, which is left open to a lot of interpretation. The statement comes after the speech by President El-Sisi during the opening of the city of New Alamein in April 2018, in which he stressed that he will not allow criticism of the police and army and considered it akin to high treason. Al-Masry Al-Youm at the time published a report, in which they tried to clarify the reasons for the president’s anger toward the media, saying that “A film, a poem and a piece of drama” behind the president’s anger, in reference to the documentary film “negative 1095”. As a result Ahmed Tarek, the film editor was arrested in case no. …., in which the Public Prosecutor’s Office accused him of … , as well as ordered the arrest of Salma Alaeddin, the director. Also, as a result, the Ministry of Interior filed a complaint against anchor Khairi Ramadan, presenter of the “Egypt Today” program on Egyptian television, after he addressed the issue of salaries of police officers, whom he described as “honorable”. The prosecution released him with a 10 thousand pound bail after spending two days in custody. The United Nations Secretariat, in its celebration of World Press Freedom Day, stressed the importance of creating an enabling legal environment for freedom of the press, at a time when the press law regulating the press and the media and the rights and duties of journalists has been delayed for three years now. At the same time a law regulating press and media institutions has been released, that addresses the mandate and authorities of the Supreme Media council and the two national agencies for the press and the media. Thus, we have a situation governed by new regulatory bodies formed by a new law in an attempt to control a climate that operates according to the provisions of an old law (Press Law No. 96/1996, which is incompatible with the new legislative structure of the press and media, thereby limiting the role of these councils and bodies to censorship and control instead of regulating the profession and enable its practitioners to work in an appropriate environment. Since its formation, the Supreme Media Council has been concerned with the formation of censorship partnerships with the journalists’ and media unions to tighten the control on everything that addresses the public, thereby confirming this authority’s hostility towards the press, sharing information with the public or presenting an alternative narrative of events, leaving the state to monopolize narrative and news. This explains the delay in the issuance of the Freedom of Information Act, which the Supreme Council was working on through a committee it had formed this year. This law is awaited by many journalists in order to facilitate their daily work and their access to official information from its sources. This is perhaps it is the same logic that governed the performance of the State Information Service recently, especially after journalist and head of the Al-Ahram Center for Political and Strategic Studies, Diaa Rashwan, assumed its presidency in 2017. It played a new supervisory role that is directed towards everything published or broadcasted about the Egyptian state in foreign media, and has resulted in many crises between SIS and a number of international institutions including BBC, Reuters and others. The crisis of the discrepancy in numbers of victims in the Oasis incident last year was a significant example of the new approach by SIS. This emerged again in March this year when Egyptian authorities, upon a call by SIS, deported the British Times correspondent “Bel Trew”, alleging she worked without permit in violation of SIS regulations. Therefore, the legal environment governing press and media freedom in Egypt is totally non-enabling, but is rather suffocating and dangerous for the security, safety and freedom of journalists and media professionals. This attention to the role of the rule of law in the provision of legal guarantees for freedom of the press was not reflected in the Egyptian political will, which sought to fully dismantle and structure the legislative, legal and institutional press and media structure in Egypt. For example, the Egyptian Constitution (2014) in article 71 completely prohibited pretrial detention cases of publishing, except in three specific cases, namely, discrimination between citizens, inciting violence and defamation of reputation of individuals. However, according to the chair of the Journalists’ Syndicate, Mohsen Salameh, the various Egyptian laws contain 35 articles that allow journalists to be imprisoned for what they publish, none of which were revised. One of the most prominent recent examples is the detention of the journalist Moataz Shamseddin Wadnan of the Arabic Huffington Post, in case no. 441/2018 against the backdrop of publishing a recorded interview with adviser Hisham Genina (currently imprisoned because of the interview) about the campaign of presidential candidate, Sami Annan, former chief of staff of the Egyptian armed forces, who was excluded from the nomination and held in detention. Egyptian authorities considered the interview to be spreading lies and aiming to undermine the stability of the country. Similarly, the Supreme Media Council also contributed to breach of the rule of law when it gave up its role in protecting competition and preventing monopoly in the media market, in view of widely held suspicions of direct interference by sovereign authorities in large-scale transfer of ownership in the media market, including the transfer of ownership of the “Egyptians’ Media” group, which owns a large number of influential media and press channels in favor of the “Eagle Capital Group”, owned by former Minister of Investment, Dalia Khurshid, and wife of Central Bank Governor, Tariq Amer. “Eagle Capital” is one of the investment companies affiliated to the General Intelligence authority, according to reports. There is also the buying of “Falcon Group” for security services on the Al-Hayatt channel networks, owned by Dr. Sayed Badawi, head of the Liberal Wafd Party. Falcon is a financial group, whose board of directors is chaired by former deputy head of military intelligence. These deals, for example, have not received any attention from the Supreme Media Council for Media – despite suspicions that revolve around them – to at least try to identify the facts surrounding those operations and their impact on the environment of free and transparent competition on the media market. The mention of the rule of law comes in the same month where Egypt is witnessing the first anniversary of the storming of the headquarters of the Journalists Syndicate for the first time in its history in May last year, following a major crisis between the syndicate and the Ministry of Interior, upon which the former chair and two council members were referred to an urgent trial. Finally, those violations of the right to a free press and media and the dangers to which journalists working in Egypt are exposed, were mentioned in the report by Reporters Without Borders (RSF), an international organization based in France working on the freedom of the press, in its report on its 2018 World Press Freedom Classification, titled “Hatred of the press threatens democracies” . It noted that tyrannical countries such as Turley (-2, 157) or Egypt (161-180) fell prey to “media phobia” – as described by the French organization described – “to the extent of generalization of accusations of terrorism against journalists and the arbitrary imprisonment of those who are not loyal to them. 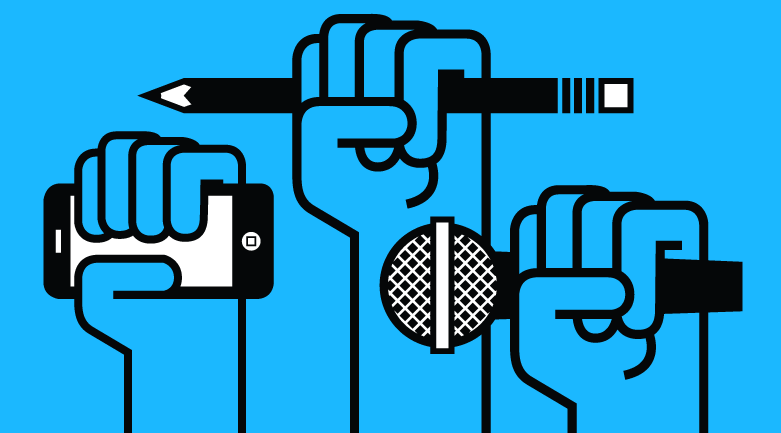 It is therefore, that the undersigned organizations, on the anniversary of the World Press Freedom Day reiterate and support the UN Secretary-General’s call on governments (foremost the Egyptian government) to promote press freedom and protect journalists.